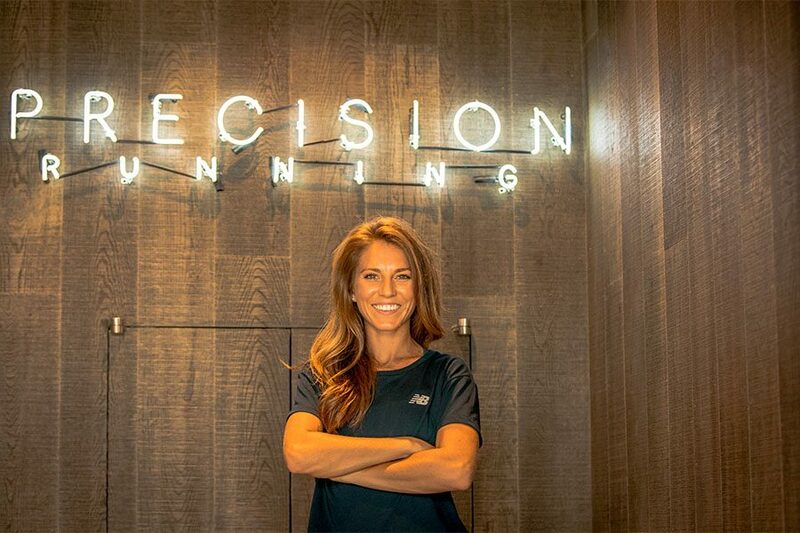 Train with Cory McGee, a Boston-based professional track athlete and two-time member of Team USA, at Equinox's Precision Running Lab. By Tessa Yannone·	 10/5/2018, 10:34 a.m. Ever wonder what it takes to compete at the highest level of a running sport? Well, wonder no more. Now’s your chance to either thrive, or try to survive, because Equinox’s Precision Running Lab in Chestnut Hill is hosting a five-week series dedicated to guiding you through intervals, speed, and distance training. And it’s all inspired by local professional track athlete Cory McGee’s own training schedule. McGee, originally from Pass Christian, Mississippi was a two-time NCAA runner-up, and six-time SEC champion. She specializes in the 1500 meter distances. She now trains and lives in Boston as a New Balance athlete—her eyes are set on Tokyo 2020, after being on Team USA twice before. And her average running distance per week? 70 miles. Luckily, Precision Lab isn’t expecting that much out of you amateurs. Week 1, October 6, 12:45 p.m.: Test your mental strength during a fartleck, an endurance run combined with sudden changes requiring a lot of focus. Week 2, October 13, 12:45 p.m.: Build your confidence during this hill run that starts slow and heavy but picks up speed as the hills decline. Week 3, October 20, 12:45 p.m.: See if you have the resilience to make it through the toughest workout in the series—the combination of speed and endurance requires maximum effort. Week 4, October 26, 12:45 p.m.: Race to set a personal best this week in this speed workout and practice your finish line dash. Week 5, November 3, 12:45 p.m.: Use what you’ve learned in previous weeks and put it into practice during this ladder workout of varying levels of difficulties, speed, and incline. Equinox members, as well as guests, are welcome during the series and each class is $30. You do not have to attend each one in the series, but it is recommended if you want to see improvement, or if you are training for a specific race. And word on the street is that McGee will be at most training sessions. Finish out the series on November 3 with a post-workout celebration where drinks and apps will be provided. $30, October 6-November 3, 12:45 p.m., Precision Running Lab, 200 Boylston St., Chestnut Hill, equinox.com.